Mega Man Hyperion 5 - Is it beatable? I've been going through rom hacks of my favorite series ever, Megaman, and I've come across a rather awesome hack for Megaman 5 that greatly lengthens each stage while keeping the overall difficulty close to the original game, a rarity for a hack. I've been really enjoying it and got to Wily Castle 1, and seem to have hit a road block. The stage is set up with two gravity reversers in the same room which flip you around....the next room is filled with spikes and a bottomless pit, so the only way to go is up, but the other gravity reverser kicks in, preventing you from doing this. I know this is confusing, so I'll post a few screenshots later. Does anyone know if this hack is beatable? Perhaps a rom hacker with experience can take a look at the rom and use a decompilier to tell if the stage is unfinished or maybe I'm just doing something wrong. PM me about it. I want to finish the hack and possibly even make a reproduction cart from it, it's that good. Thanks. That penguin sure looks pissed. Re: Mega Man Hyperion 5 - Is it beatable? I've never heard of this hack you're mentioning,do you have a link for the Ips patch ? I don't have an ips patch, only the already patched rom. I'd post it here, but since most fourms dont like that, I'd better not unless I get the okay to do so. I do want to get more information on this hack though. The hack doesn't reveal who made it or when, a revision, anything. All I know is that its a hack of the English Megaman 5, not Rockman 5. Hows the music? Is it custom or preset? This hack doesn't change the original Megaman 5's music, boss AI, weapons, graphics or anything like that. It might even appear to be completely unaltered at first. 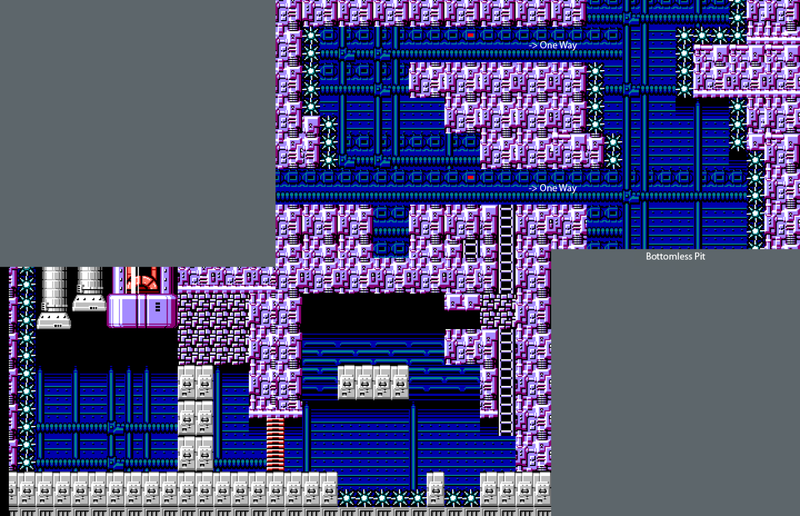 What it does do is greatly lengthen each stage by adding in whole additional sections onto the original Megaman 5 stages. It does this for every stage from the right robot masters through all of the Darkman Blues stages too. Wily 1 also seems edited, but I can't figure out how to proceed past the first ladder. You have to blast junk blocks away to climb the latter, but then you end up in a room with two gravity inverters from Gravity Man's stage. The next room is a death trap pin, so I wonder if there's some way to go up instead? I tried everything I could think of, but you can't jump on Super Arrows when upside-down, and Rush won't land upside-down for either Coil or Jet. There seems to be no information on this hack that can find anywhere. I'd like for someone with rom hacking experience (megaman rom hacking experience preferred) to take a look at it and tell me if its incomplete, or if I'm just not doing something right. I like this hack so much I'd like to make a reproduction cart of it, but only if it's finished! I've screencapped together what the stage looks like as far as I'm able to proceed. At the first two screens, you need to use Rush Coil or Jet to get up and destroy the Dust-Man destructible blocks. Then climb the latter. If you go to the right, you can't go back to the left. Going left causes you to hit a gravity inverter (marked red), which flips you upsidedown. If you keep going, you'll hit another one and then have no choice but to proceed right. On that screen though, there is nothing but a death trap pit and spiked walls. I wanna finish this game if its possible! If its not finished, is there anyone in the rom hacking community who might be able finish it up? The hack is based on the original levels but it just expands on them. No new AI or crazy difficulty. i certainly have not ever heard of that hack name ever before..
but... i just did manage to find it. It is actually listed here.. The download link is not avaiable, because it was on Megaupload...and that's been shut down by the FBI. Anyway, it's easy for you to check wether the level is completable or not.. just open the rom with the "MegaFLE" level editor to see. Well, you should upload a ips of that hack if you want people to find it seeing as it's impossible to find. Here I have the database with titles and snapshots only. Hyperion 3 isn't nearly as good, but that's cool too. For those who might want more info Megaman Hyperion 5 has massively long stages. For example, using screenshots, I've photoshopped together a map of Napalm Man's stage in this hack. This stage is about twice the length of the original Megaman 5's. right click > view image to see it at a reduced, but still larger size. Not sure if its possible to upload it in its native resolution. I think the forum auto-resizes large images. Now that the patch has been re-distributed, can someone with rom hacking skills and particular knowledge of Megaman hacking tell me if the hack is finished or not? Not sure exactly how level hacks work, but wouldn't there be an obvious point in the rom where the edits end if that's the case? Other unfinished Megaman hacks I've come across will literally be filled with garbled graphics and you'll be unable to proceed because there's nothing to proceed to. Since there aren't garbled graphics here, I'm wondering just what the case is. Maybe the game IS finished. I have no idea. I took a look at the level, just because I was curious about the editor. Unfortunately I only can tell you that there is an M container near the gravity trigger. Watching the next screen I don't think there is a way up and there are also no other objects. Oh, and the game is not finished there. I found a glitch where when you die half way in Shadowman Stage, the screen where a 1up & an E-can, the checkpoint there doesn't scroll! I'm stuck! I can upload the save file from NESTERJ for PSP if that helps. otherwise, try the password. It only goes up to Protoman 1 though, so you'll need to play through four stages to get to Wily 1 where I'm running into the problem. here's the password for Protoman 1. Let me know if the NESTERJ save state is something I should upload.